Sitting at my son’s basketball practice, I turned to a friend and said, “I’ve missed seeing you!” We recounted sickness and Christmas Break and snow and a busy week getting back into the swing of life. I texted with a friend about something specific and then said, “And I miss you!” I told another friend we needed to get together soon. I’ve been making plans with people – mostly in my head and sometimes on the calendar. I am surrendering to the circumstances that come with raising three kids in three different seasons of life and having friends who are doing the same. I am surrendering to the white space on my calendar because my soul is best that way. I am surrendering to the new thing God is doing in my heart. I’m hoping I get to lunch with one friend soon, go for a walk with another, and play Settlers of Catan with another. I have ideas and plans. rescued requires that action and attitude. And I’m glad to have friends on the journey with me – even if I miss them sometimes. I’m joining Five Minute Friday with this post. The prompt is SURRENDER. Just set a time for five minutes and write. Then link up. Kristin, this post. Yes, I’m in the thick of it with you. Raising kids is the main calling on my life, my time, my heart right now. But I still miss/want/need the companionship of others in that same place. But I also need that white space on the calendar of which you speak. It’s reassuring to know we are not walking this journey alone, isn’t it? I love that God gives us others to lift us up, and whom, in turn, we can lift up. I thought it would get easier when school started but it’s been even more of a challenge to connect with friends! I’m thankful for those unexpected moments. I’m thankful for those unexpected moments too! Thanks for stopping by, Annie! 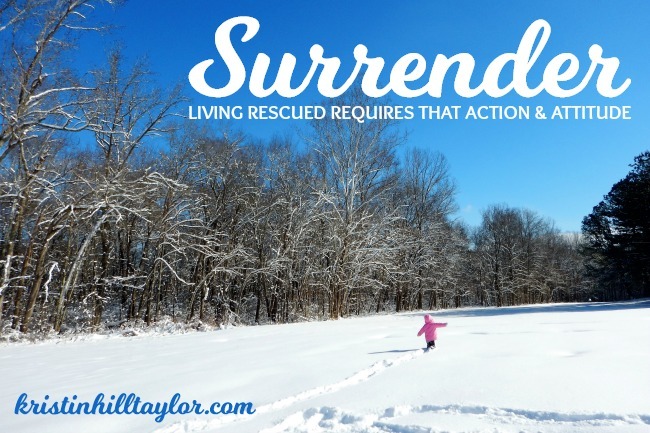 Kristin, such a great reminder that surrender looks different depending on the season. I’ve been slow to accept and appreciate seasons, but I think I’m getting there. 🙂 Thanks for being here, Stephanie! Isn’t it amazing how surrender is continual? It isn’t a once and done thing… but a constant catch and release! Yes, it’s definitely continual. Thanks for being here, Traci! I just remembering that life comes in seasons and just as soon as we’ve come to terms with one, we’re into another. In a blink (hopefully ;), we’ll be empty nesters sitting on your porch drinking tea and coffee with years to catch up! Yes, those seasons are always changing! Glad you’re here, Melissa!